Now that the weather is cooling down it’s time to start thinking of making garments to keep us warm. I have to admit that, for me, the word ‘garment’ conjures up nightmares of multiple pieces and dreaded seaming. However I find myself recently dreaming of making cardigans, vests and jumpers. 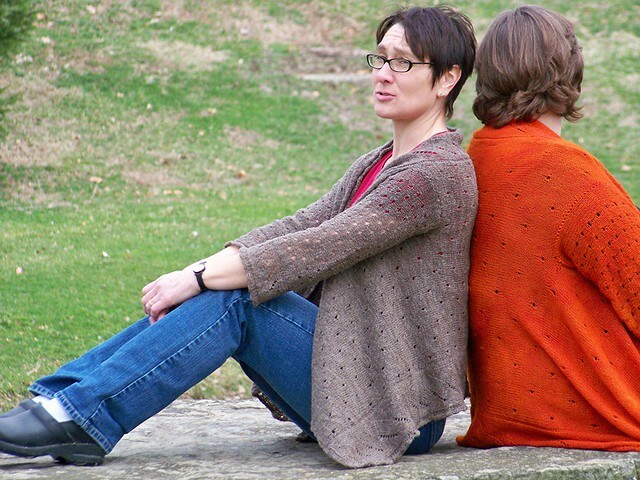 This week I have chosen to look at two cardigan patterns. Originally designed as a Knitty knitting pattern for hand spun yarn, the Daedalus Wrap Cardigan works equally well using commerical 4ply yarn. This easy oversized cardigan/wrap is basically worked as a rectangle with sleeves; the corners of the rectangle create a feminine swing/drape at the hemline, or a double thickness front panel when pinned at the throat. A simple lace and eyelet pattern breaks the monotony of plain stocking stitch, making it ideal for lace beginners or a TV knit for more experienced knitters. For crochet lovers, we have the C3 Crochet Crop Cardigan. Simple feminine lace makes this cardigan interesting, whilst easy construction and 10ply/worsted weight yarn make this a quick, easy project. US crochet terms are used; see here for conversion into UK/Australian crochet terms. This cardigan can be easily adjusted to change the length of the sleeves and body; just make sure to adjust your amounts of yarn accordingly!